This Golden Haloumi Salad is just delicious. 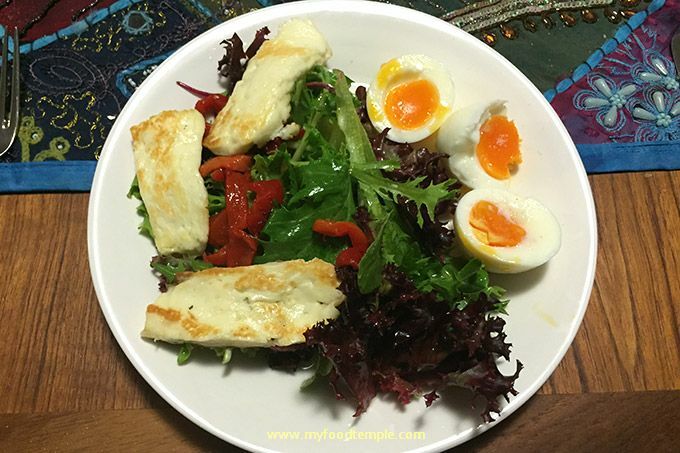 The lightly pan fried haloumi with the beautiful golden egg yolks, fire roasted capsicum and lettuces is super scrumptious combination. I am salivating as I write this. It is truly a main meal in itself, although you could divide it into three and serve it as a yummy side (it wouldn’t exactly be criminal, but you will be left wanting more). The eggs and lettuce provide loads of vitamins, go perfectly with the dish and make you comfortably full. The fire roasted capsicum adds that extra tasty zip. It is a quick and easy dish to make. I must say though, don’t ever have me around your kitchen if you want to make sure there is haloumi left over – seriously, that stuff is just dangerously good. I find this salad so satisfying that I actually cannot stop talking about it for at least 24 hours after eating it. I wouldn’t say I’m obsessed with it, but……I am in love. Note 1: The preparation time will be longer if you have to make your own fire roasted capsicum (ideally done in a wood fired oven, but you can also just roast the capsicum in a normal oven). Note 2: If you choose to use a different dressing, it is best to use a subtle one with lemon ideally.